Prefabricated concrete building elements that are made or manufactured elsewhere than their final position in the structure. The Opposite of cast in-situ. Cast in place. Concrete that is cast in place. Formwork is used to hold the wet concrete in place. 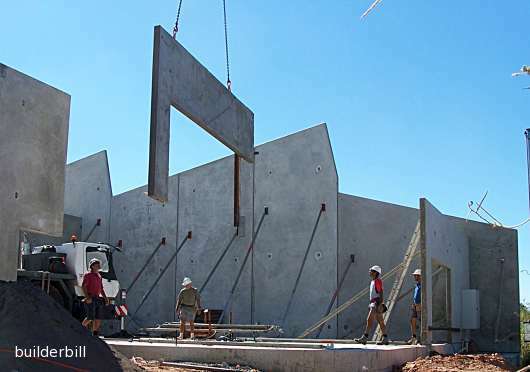 Precast products range from small mass produced items like the concrete hollow masonry blocks below to the cast on site tilt up wall panels above. precast concrete products have certain advantages over cast in situ work. In the case of the wall panels above they are an excellent method of quickly building odd shaped and repetitive wall panes. The factory made blocks below have all the advantages of an automated factory environment with it's degree of quality control that is not seen with in-situ concrete work. 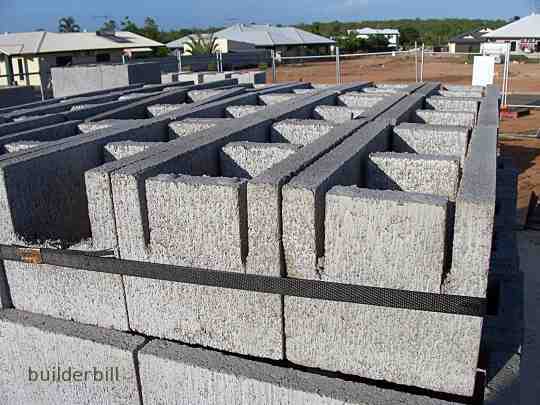 A quite large precasting factory was set up in my home town of Darwin to make concrete railway sleepers for the new Darwin to Alice Springs railway line.